Heartwood Hickory Shafts Hard Felt and Soft Fleece Covered Felt Heads "Fulcrum Notched" Handle Graduated Length Recommended Drum Sizes / Head Sizes / Length: FB-1(S): 16" - 18" bass drums, 1 3/8" x 1", 14 1/4" FB-2(S): 18" - 22" bass drums, 1 5/8" x 1 1/4", 14 1/4" FB-3(S): 22" - 26" bass drums, 1 7/8" x 1 1/4", 14 1/4" FB-4(S): 26" - 30" bass drums, 2 1/8" x 1 1/2", 14 1/2" FB-5(S): 30" - 32" bass drums, 2 1/2" x 1 3/4", 14 3/4" The Field Series Marching Bass Drum Mallets again feature our unique and innovative "fulcrum notched" heartwood hickory shaft creating a drumstick-like feel and balance. 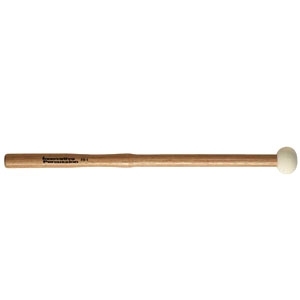 Graduated in length, these mallets allow players on any size drum to easily achieve good playing technique and beater placement, while affording them better feel, response and rebound. These mallets are constructed with our heartwood hickory for increased durability and extra hard felt heads, with no flat spot, for strong articulation and durability. Also available with soft fleece covered felt heads.